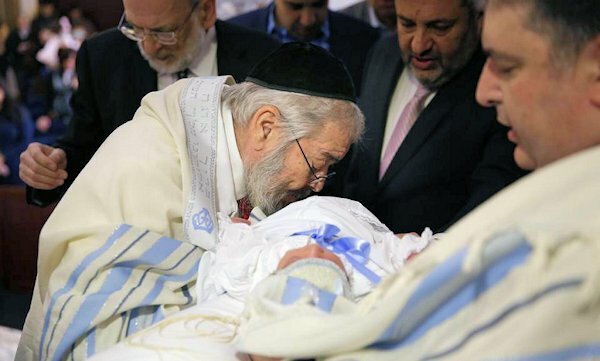 The City of New York on Tuesday announced that an agreement had been reached with members of the ultra-Orthodox Jewish community over circumcision involving oral suction . Health officials earlier linked 17 cases of infant herpes since 2000 to the ancient ritual of sucking blood from the wounds on the infants' penises. On Tuesday, New York Mayor Bill de Blasio's administration said circumcisers (mohels) should no longer be required to obtain signed consent forms before the rites. Administration officials said they would ask the Board of Health to vote to rescind the requirement while working with a coalition of rabbinical leaders and medical experts to educate members of the ultra-Orthodox community about the possible dangers of the practice, known as 'metzitzah b'peh' in Hebrew. A vote is expected in June. Oral suction circumcisions first came under scrutiny in 2012 during Mayor Michael Bloomberg's administration, which asked parents or guardians to sign consent forms indicating they understood the medical risks. But the city's mohels, believed to perform more than 3,000 rites annually, say they applied strict medical procedures, including testing for herpes, sterilizing their hands and rinsing with mouthwash before the ceremony. Rabbi A. Romi Cohn, who has performed 35,000 circumcisions, was quoted by the news agency AP as saying that he believed babies could have contracted the herpes virus from sources other than mohels. New York City officials said that DNA testing by health officials likely would prove or disprove whether there's a match between an infected infant and a mohel. If not and a baby still tests positive, health officials will try to seek the source of the herpes, which often results in skin blisters. The agreement fulfills the mayor's commitment to find a more effective policy that protects children and religious rights. "Increasing trust and communication between the city and this community is critical to achieve the administration's ultimate goal of ensuring the health and safety of every child, and this new policy seeks to establish a relationship based on engagement and mutual respect," the administration said in a statement.